The latest revision (2002) by the United Nations Population Division of their world population projections contains warnings about serious population decline by 2050 in most of the developed nations and even in 75% of the under-developed ones. Moreover, the UN estimates that the proportion of the world's elderly will nearly triple, increasing from 606 million in 2000 to nearly 1.9 billion by 2050. In more developed regions, the population aged 60 or over currently constitutes 19 per cent of the population; by 2050 it will account for 32 per cent of the population. That means that there will be far more elderly than children, a sure sign that the populations in the countries affected by fertility rates that are far below-replacement levels will die out rapidly. 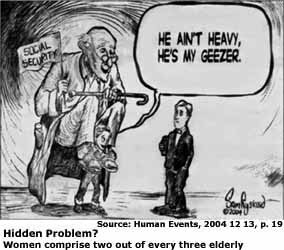 For example, by the year 2050 the population of Italy will have declined by 22 percent, and that of the Russian Federation by 50 percent, while a disproportionately large and growing sector of the surviving population will be elderly (the vast majority of those elderly will be women left to fend for themselves). Many other developed nations will not be much better off. Their populations are dying off, too, maybe a little less rapidly, but their fertility rates are still falling more and more below replacement levels, with no end to the decline in births in sight. About half of the decrease of 400 million for the population projections for 2050 from levels forecast in the UN's 2000 projection is due to taking into account now the rapid increase in the number HIV/AIDS deaths. Mind you, the UN has a solution in mind to soften the impact of the population calamity, massive redistribution of the world's population. The REPORT Newsmagazine changed its name to Citizens Centre Report. That is a consequence of the launching of a new Canadian think tank, the Citizens Centre for Freedom and Democracy. As Link Byfield explains in his March 3, 2003 letter from the publisher, 30 years have gone by since The Report magazine was founded. That was enough time and effort for problem identification. It is now "time to move on to solutions and constructive options." You may want to rush out and get yourself a copy of the March 3, 2003 edition of the Citizens Centre Report before the news stands run out of copies  if you are not subscribed already. This edition is bound to become a collectors item. To give you a taste of what it contains, look up these two articles from this Special Edition on Refederation. This is a set of graphs showing the distribution of child custody awards in Canada. The pages contain also related information on the policies and politics of child custody awards in North America, in addition to pointers to sources of more information. Paul Millar's pages have not been functioning for a while. They can now be accessed here. Judge: Right to an attorney a 'multiple' choice. It depends on "who" is speaking to the arresting officer at the time of an arrest. Equitable justice loses and the criminal, a woman, wins. Wade F. Horn, David Blankenhorn, and Mitchell B. Pearlstein, eds. The Fatherhood Movement: A Call to Action. Lanham, Maryland: Lexington Books, 1999. ISBN 0-7391-0022-X. The last five years has seen an explosion of campaigns dedicated to the crisis of fathers who are cut off from their children. Some are large, well-funded national organizations, generally dedicated to promoting responsible fatherhood in cultural rather than political terms. Others are small, scattered, and ragtag groups concerned with the political and constitutional rights (or lack thereof) of fathers and their children. The relationship between these two wings of the fatherhood movement has thus far been largely complementary and amicable. They share the aim of promoting awareness of the importance of fathers and families, and rights and responsibilities are, clich— that it is, undeniably two sides of the same coin. But as the movement grows (which it is doing by leaps and bounds), friction is bound to increase. If the Minister of Justice is not prepared to listen to the people of Canada, then he should resign. 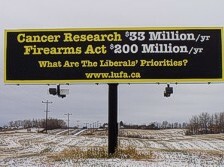 The photo shown below is of a highway bill board that is being sponsored by LUFA (Law-abiding Unregistered Firearms Association, "25,000+ Members and over 5 million unlicenced supporters!") and is located on Highway 16A West, near Edmonton. Tens of thousands of people see it every day, and it is only the beginning of a billbaord campaign by LUFA. Ever since its inception, the scheme to disempower Canadians by forcing them to register their firearms and thereby to raise enough money to have them finance their own demise, many voices pointed out the inherent fallacies of such a hair-brained undertaking. The Liberal goverment and its last three successive justice ministers, Allan Rock, Anne McLellan and Martin Cauchon, could not be deterred. They found ever-novel ways to create and fund a new, massive, billion-dollar bureaucracy and to pull the wool over the eyes of voters and Parliament alike. The deal was presented as a bargain that nobody could possibly resist at a price of a mere $2 million to set it up. However, truth is stranger than fiction. Reality set in, and even though our government insisted that the deal was still the best possible if only we would continue to throw more money at it, on December 3, 2002 the Auditor General, Sheila Fraser, opened many people's eyes by pulling back some of the wool that had covered them and blew the whistle on one of the biggest scams ever pulled on the placid and unsuspecting Canadian public as well as on a collaborative Parliament that usually and customarily did nothing else but vote the way its leader told it to vote. The January 6, 2003 issue of The Report Newsmagazine contains three articles by Peter Stock that describe some of the details of the billion-dollar fiasco reported by Sheila Fraser and more that must be read. The last movie about the sinking of the Titanic captured the imagination of people across the world, but it did not delve all that far into the hard reality of the full extent to which many men sacrificed their lives to save those of women and children travelling on the Titanic when she went down. Why not? Exact figures are known and available and have been for many, many years, ever since shortly after the sinking of the Titanic. Men are being trained from childhood on to perform such heroic deeds, and the sinking of the Birkenhead (Feb. 26, 1852) off the Cape of Good Hope, in which all women and children were saved but hundreds of men voluntarily perished, proves the point. ...but it does correlate with observed trends in precipitation. Feminists try, and succeeded, to indoctrinate virtually all of society into believing that women were being oppressed as far back as antiquity. The truth, however, as is usual with just about all of what feminists claim, is something totally different. It was women who lived in luxury and boys and men who were being most brutally oppressed. There were interesting aspects to child raising in Sparta. Boys were taken into custody by the State, who then treated them with the utmost brutality. Spartan men received their freedom at age 60 (if they lived that long; a lot of them died sooner). But there is something even more interesting about those circumstances. Women got off with luxury and freedom to such a large extent that they wrecked Sparta. You better believe it. So, what is new? That is indisputably on the record, but, given that the education curriculum is being rigorously controlled and censored by the feminist totalitarian regime, that is not being taught anymore in our schools. You may think that global warming or, better, the ratification of the Kyoto accord that our Leader, Jean Chr—tien, the head of the Liberal Party of Canada, threatens to have passed by Parliament before Christmas and to ram down our throats will have little impact on you or your family. You would be seriously wrong in thinking that. Is our health-care system really that bad? The power of the State is in the details and the chicaneries it subjects us to, according to the justified complaint by Keltie Zubko, the editor of the Western Separatist Papers, who had to re-submit evidence several times, for trivial and even unspecified reasons (once for having the books bound in covers that were the wrong shade of buff). US  Hasbro, producer and distributor of toys, discriminates against boys! Tomorrow is closer than you think! Jack Kammer, in If Men Have All The Power How Come Women Make The Rules? (Translation into French), demonstrates that women always had the power to make the rules. The hand that rocks the cradle is the hand that rules the world. Angry Harry expresses views that appear to agree with Jack Kammer's, but he goes a little farther. He identifies that women have been abusing their power, are doing that increasingly so now, that the machinations of feminism have wrought much and escalating hatred between the sexes, and drives home his point with solid reasoning. He speculates that, if women don't wake up to what they are doing to "their" men, there will be a backlash, and that because men managed to breed dogs and cattle, so as to domesticate them, they will do the same with women. Men do have the power and natural ability to do that, far more so than women ever did and do. Far out? Not really, not as far-out as the idea proposed by Sally Miller Gearhart and gleefully condoned by some radical feminists like Mary Daly, that men must be reduced to ten percent of the population (to maintain genetic diversity) if women are to have a viable civilization at all. The innate generosity and chivalry of men towards women appears to come to the surface in Angry Harry's musings. Angry Harry is not proposing to eradicate 80 percent of all women, but he suggests that it will be far better to increase their numbers and to produce women with the right extent of docility. Why not, eh? After all, it appears to be working. Men already comprise the largest visible minority, relative to the larger number of women, in virtually every nation of the world. There'll be less and less competition by other men for potential mates. It could make for a far more peaceful world than the one we've got right now. Mind you, I have a few apprehensions. Will having fewer men and more women around cause women and men to be happier or more content? Be careful what you wish for, you may get more than you can handle. The Chinese ideograph for domestic tranquility is a symbol depicting a hearth, a woman and a roof over both. The one indicating strife depicts a hearth and two women under one roof. It'll take some fancy breeding to get around that little problem, but men came to terms with far worse. An opportunity to sue the police? Ontario court decides that it is time to provide for contingency fees for lawyers. The "Leader" of Canada announced which way he wants his Members of Parliament to vote by the end of 2002. He wants them to ratify the Kyoto accord. The price Canadians will pay for that will be the loss of about 450,000 jobs over the next ten years. Have no illusions. The majority of people losing those jobs will be men. Updates: At irregular intervals — Most recent items shown first in the list.